A luxury gaming chair is part of the $1,300 prize package. We've teamed up with online game retailer Fanatical to offer readers the chance to win a bundle of gaming prizes worth a collective $1300, to celebrate the start of their huge Winter sale. One lucky reader will get it all—and today, we can reveal that the second prize is a HERO Black & Red luxury gaming chair that's worth $440, provided by noblechairs. Fanatical will send these prizes globally, so there are no regional restrictions on entering. The final prize in this bundle will be revealed tomorrow at this time: 8AM PT/4PM BST. 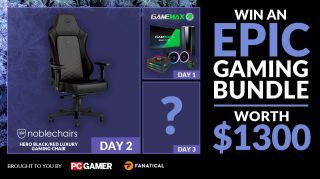 Yesterday's prize reveal was a GameMax PC gaming bundle—read all about that here. The mechanics of the competition are operated by Fanatical. You'll find their terms and conditions at the bottom of the widget below, where you can enter in a whole host of different ways. As per Fanatical: The contest winner will be selected at random and notified by Fanatical on January 3rd 2019. They will then contact each partner and them to send the prizes direct to the winner’s address (phone number, postal address & email address required). The competition ends on January 2nd 2019 at 8AM UK time.